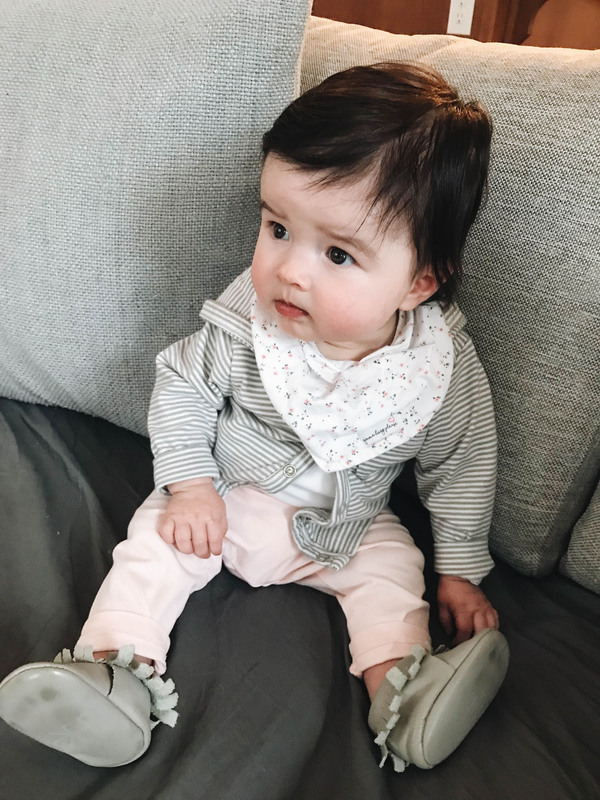 Apologies for not getting Harper’s 6 month update on the blog last month. I’m hoping I can cover everything in this post, although I can’t remember what happened yesterday let alone last month, lol. I do know that Harper is at the age where everything is so fun. I mentioned on Stories how 7 months is the age where you think to yourself, I definitely want another one. Which is huge because I was saying no way after a traumatic birth just a few months ago. She’s just so darn cute and fun right now. To think, I love her more and more everyday, is just crazy. 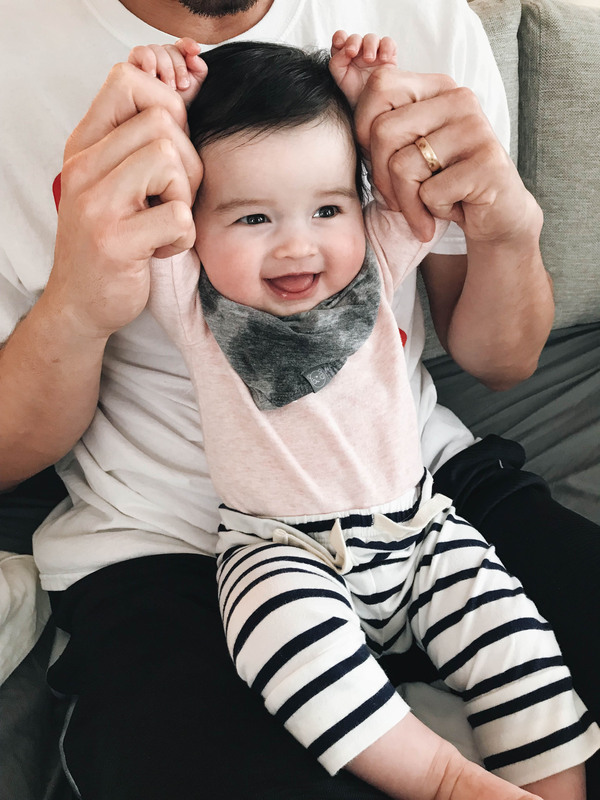 If you’re reading this and struggling – lack of sleep, baby isn’t napping, etc. – I promise, it gets better. Where do I even begin. I just read back her 5 month update and man she’s come so far. She’s just so much more alert and mature. She honestly seems like a little girl. She has good coordination with both hands – grabs everything. She doesn’t have any teeth yet and still puts everything in her mouth. She smiles at all our funny faces and really studies our hand gestures. She’s a rolling machine. She rolls around in her crib while she naps and it’s funny to see her in one spot and then check the monitor and she’s at the other end of the crib. I’m like how? She recently started finding her pacifier in the crib, which is so nice for the parents. She has been on solids for a good month now. 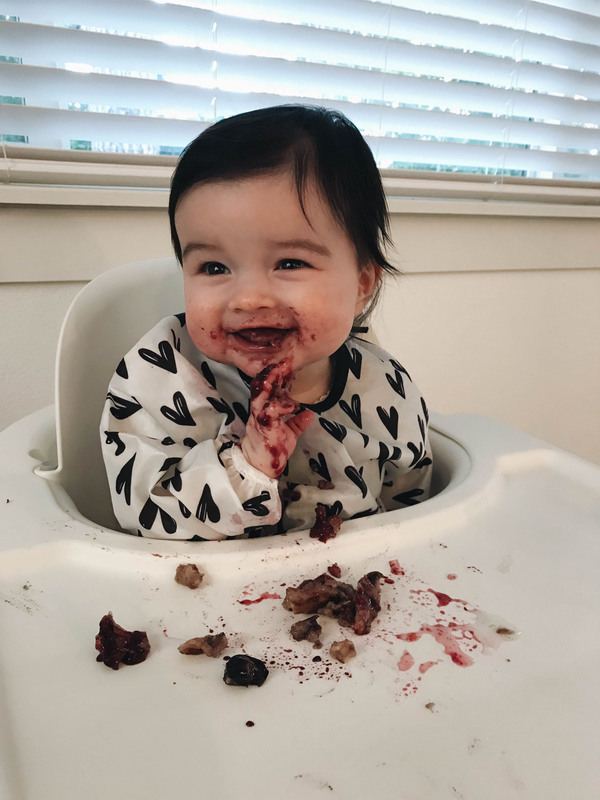 We’re doing Baby Led Weaning and it’s been a lot of fun. A mess, but fun. I will go more into detail on this in another dedicated post. 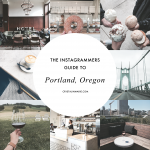 I’m hoping to share what we’ve been eating and any tips we have. She’s still enjoying her baths, although it seems like she’s outgrowing her baby bath tub. We’re headed to Black Butte this month and it will be her first time in the pool. She’s been splashing in the bath, so I hope she will love the water. Mike and I are super excited! 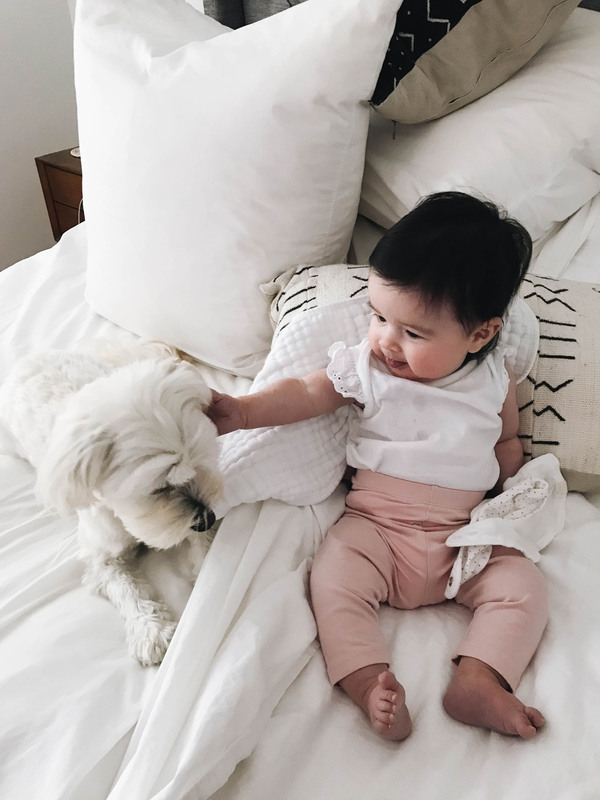 My favorite thing that she’s doing right now – giving kisses when we ask for them. They’re open mouth kisses, but they’re still the best. Naps have been SO MUCH better! We ended up tweaking her awake time and it’s helped a lot. We were struggling with the 45min-1hr wake time and while there’s still occasions where she wakes up at this time, we either get her up or leave her be (if we know she’s still really tired) and let her cry it out. It usually takes her no more than 20 minutes to fall back asleep. A few things we’ve learned in the last few months with naps: 1. If she’s team no nap, we know she will nap well for at least 1 of the 3 naps, so we don’t mind getting her up and letting her hang out for the other two. 2. Always give her the opportunity to fall back asleep on her own (don’t intervene). These 2 things have taken the pressure off naps and has made the process less stressful. Her age has also helped. She isn’t as crabby when she doesn’t nap the full 2 hours anymore. Our thing has always been, we don’t mind if you’re awake, just don’t be crabby. She’s also going down really well these days. 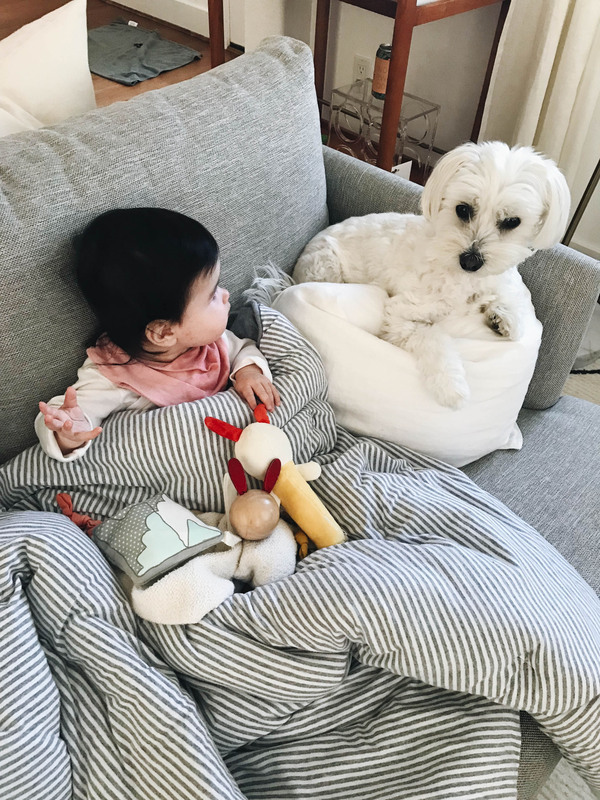 For a minute there, she would fuss and cry once we set her down in the crib. Lately, she’s been happy, takes her pacifier, and falls right to sleep. She’s been in her sleep sack for a good 2 months now and it’s going really well. I think the transition from the Merlin Sleep Suit to a sleep sack can be tricky. For us, it took maybe 2 days for Harper to get the hang of things. Once she was in her sleep sack she started rolling to her tummy. The first day she rolled over she napped so well during the day. Mike and I were shocked. Then that night she woke up every 15 minutes. We finally let her cry it out at 11pm and she slept for the rest of the night and has been fine on her tummy ever since. It may take your baby longer to get used to sleeping on their tummy, which is why I say the transition can be tricky. 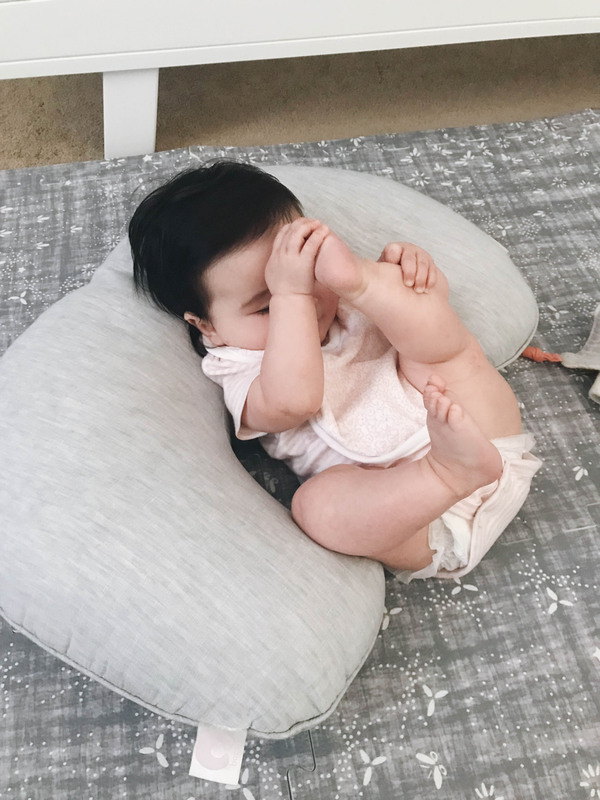 I mentioned we enlisted a sleep coach for naps in my 5 Month Update post. 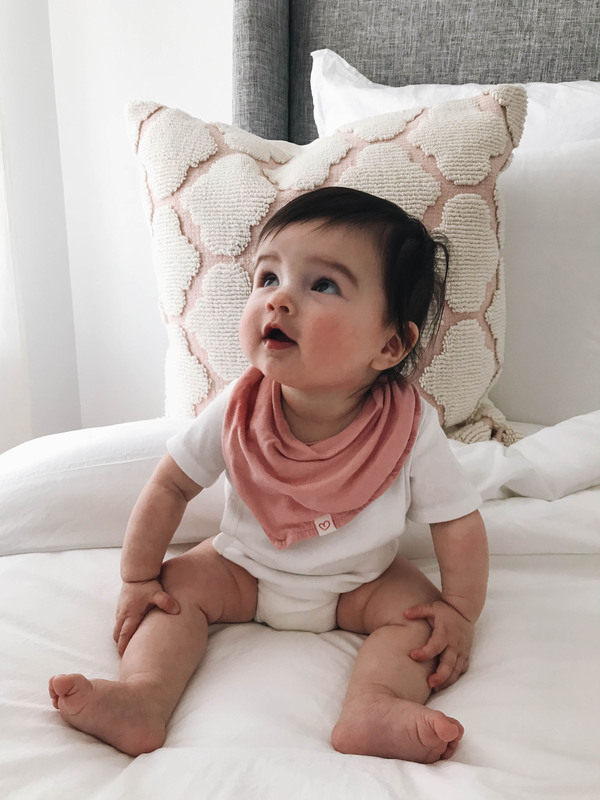 We tried the cry it out method for a week and ended up stopping. 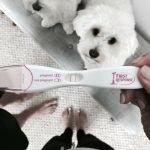 After going through the process we knew it wasn’t for our family. I just didn’t feel like it fit Harper’s temperament. I did take some tips from the experience, which is why in some instances we do let her cry/talk it out (max 20 minutes). Tweaks on our end have also helped. In general, we’re in a really good place with naps and bedtime (more on this below). Bedtime has been going smoothly for some time. We’ve done the same bedtime routine since she was born and Harper has it down. We did move her bedtime up to 6pm from 7pm. We noticed she wasn’t lasting in those last hours and rather than fight her to stay up, we tweaked our schedule and now she goes down an hour earlier. We’ve played with different times and she wakes up at 5am no matter what, so she might as well go down earlier. It’s a win win for everyone. These days it seems like she’s so ready for bedtime. When I put her down, she’s happy as a clam and ready to peace out for the night, lol. Just a refresher, our bedtime routine consist of this: bath every other day, pj’s, hair brush, feed, song, sound machine, and down with her pacifier and bunny. She usually falls asleep within 2-8 mins. For a while I was giving her a 7 minute feed (we call it a snack) at 5 am and then would put her back to sleep until 7am. I would get up at that time and drink my coffee and have some alone time before the whole house woke up. She stopped falling back asleep, so we cut that out and now we let her hang out or fall back asleep until 5:30-6:00 am. I get her up and feed her around this time and get our day started. 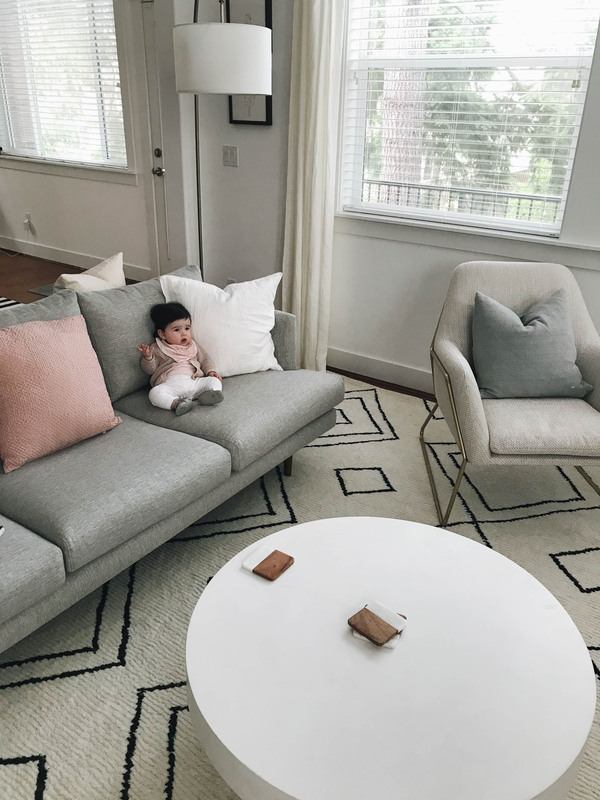 Something I’ve learned through the process – just because every schedule or sleep coach out there promises your baby will sleep 7pm to 7am doesn’t mean it works for everyone. I’m totally fine having Harper sleep from 6pm- 5am. She’s getting her 11 hours sleep, and the parents are getting a good amount of alone time in the evenings and getting a head start to the day. You gotta do what works for your family. 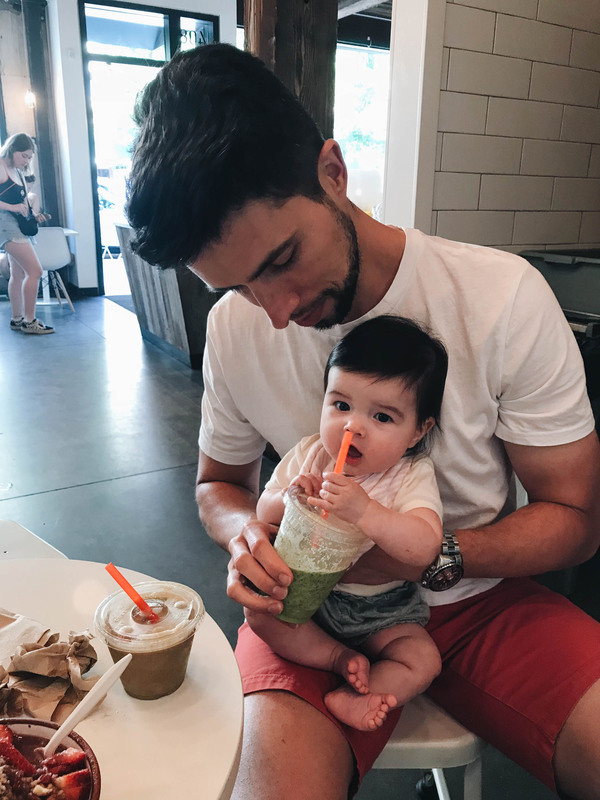 We started feeding Harper an 8 ounce bottle once a day so that I could get a break and focus on work. That was going well until I realized my supply was dropping. I don’t know if it was because we cut out one feed on the breast or if it was a timing thing, but we’ve recently stopped the bottle and have her back exclusively breastfeeding. I’m still pumping once in the morning, but I may add another session to help increase my supply. I’m planning on making lactation cookies this week, so I’ll keep you updated on how those work. We’ve also started incorporating a bottle at bedtime. I will breastfeed and supplement with a bottle just to help her sleep through the night. That has been going well and Harper loves it. As mentioned above, we started Baby Led Weaning last month. It’s going pretty slow as we’re still trying to figure out how to get 2-3 sit down meals in our schedule. 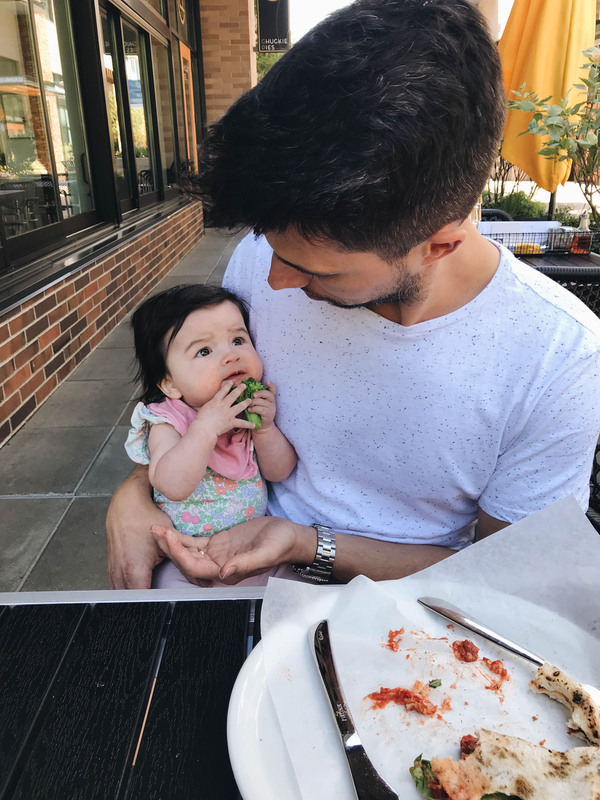 So far she has had bananas, strawberries, watermelon, cantaloupe, apples, broccoli, asparagus, sweet potato, blueberry fritters, pancakes, avocado, cucumber, bell pepper, and I’m sure more that I can’t think of. Again, I will do a more detailed post about our experience in a different post, but for the most part we’re all enjoying it. Watching her explore and try new things is so fun. She’s also a big fan of water. She’s still learning how to use her sippy cup, but she LOVES drinking from a cup. The second she hears the water dispenser on the fringe, she throws her hands up super excited. Harper’s activity has changed so much as this age. She’s awake a lot longer, which means her parents are very busy, lol. Not but, it’s been so fun. Watching her learn to sit up, roll over, play with all her toys, pick her favorite toys, pet the dogs, walk around in her walker, jump in her jumper, go on walks in the carrier, I mean the list goes on and on. The walker has been a life saver. She loves her freedom in it and use it any time mom or dad needs 2 free hands. She also loves being outside. When we walk by our back or front door she starts lunging toward the door or looking at the door handle. I’m like how do you know this already?! 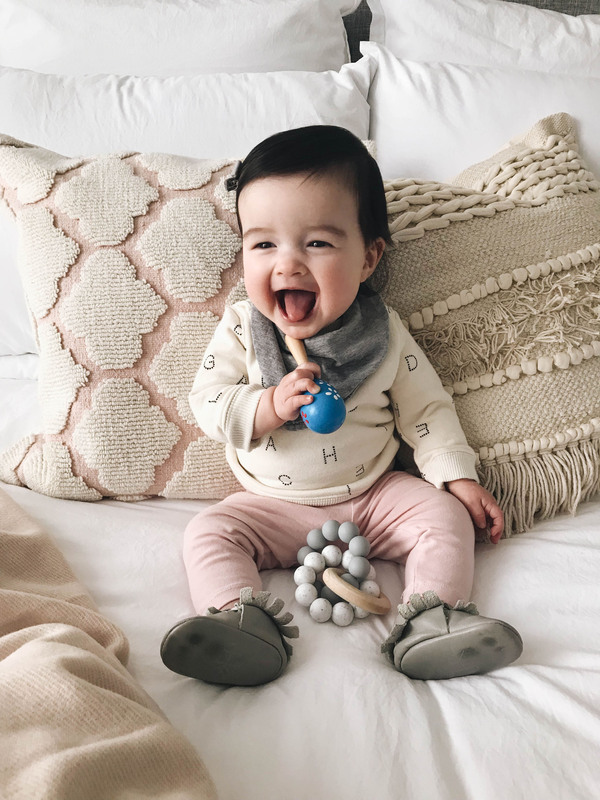 Lately, she loves playing with her blocks and the maraca is her absolute favorite toy. 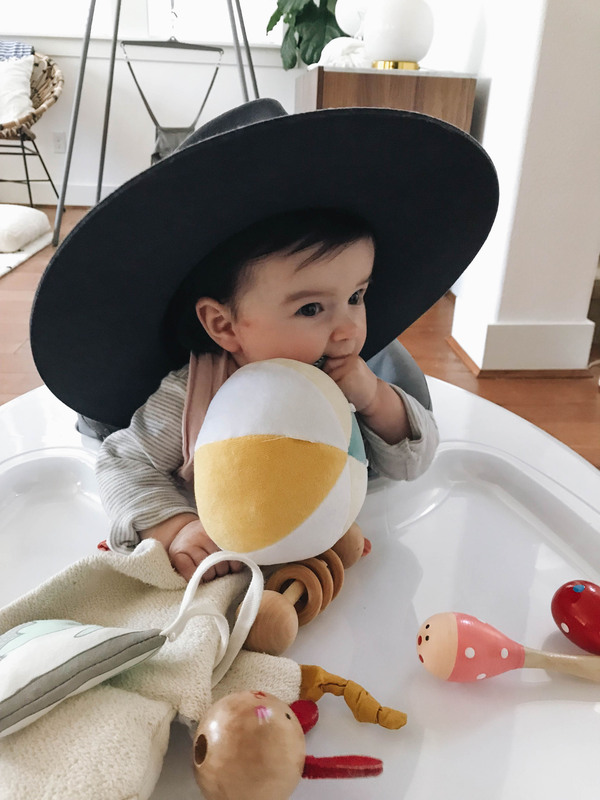 Maraca Shaker – I saw another blogger have this for her baby girl and ordered a pack on Amazon. At first Harper didn’t really notice or care about them and then in the last couple of weeks they’ve become her favorite toy. She actually puts the handle in her mouth which I was worried about in the beginning, but she’s so careful with it. Obviously, I still keep an eye on her when she puts it in her mouth in case she falls forward, etc. They’re small in size, which is a little worrisome, but they’re actually perfect size for baby. Musical Ball – I ordered this a while back on Amazon and she recently started playing with it. 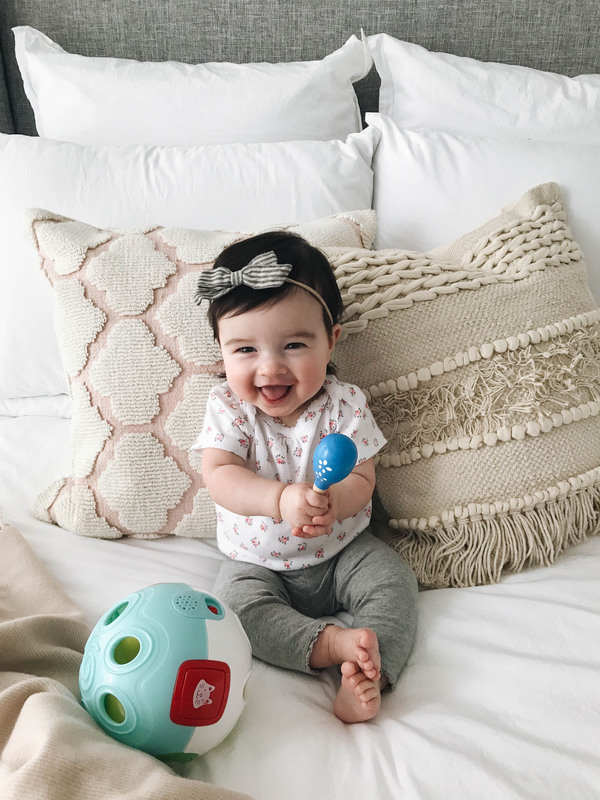 We mostly use it with the sound off because it’s quite obnoxious, but Harper loves picking up the ball, putting it in her mouth, and even pushing it away watching it roll. Gap Zipper Sleepers – I ordered sleepers in different sizes while I was pregnant not thinking about the buttons versus zipper debate. At the end of the day both Mike and I have loved the zippers over buttons especially when you have a cranky baby that just wants to be fed, lol . I found a couple of these on sale and we love them! Harper has these in 6-9 month size and they’re a little big now, but she has room to grow. Soft, great quality, and easy on the parents. 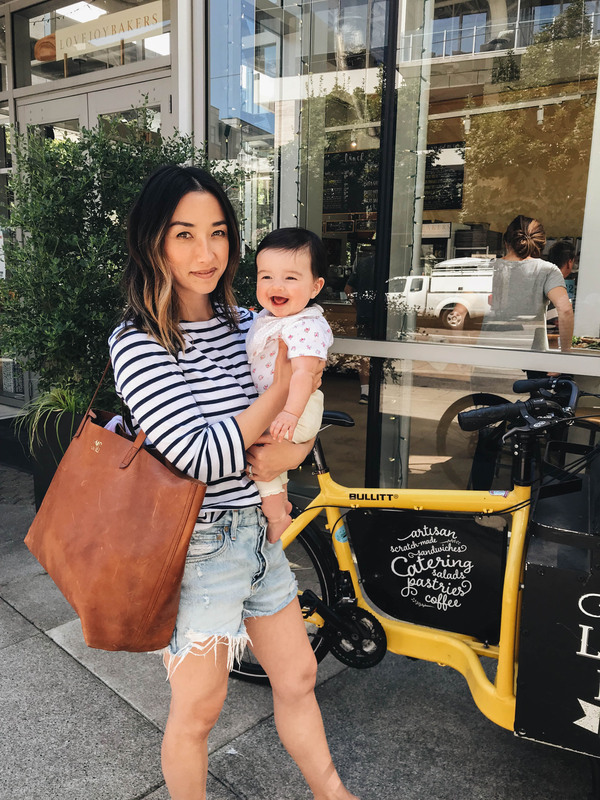 Ergo Baby Carrier – We bought the Ergobaby Adapt while I was pregnant and being a first time mom I had no idea apparently what I was doing. I didn’t realize that this carrier only allows for baby to face you and not face forward. Harper didn’t love being in a carrier with her face toward us ever really, so we didn’t get use out of this carrier. 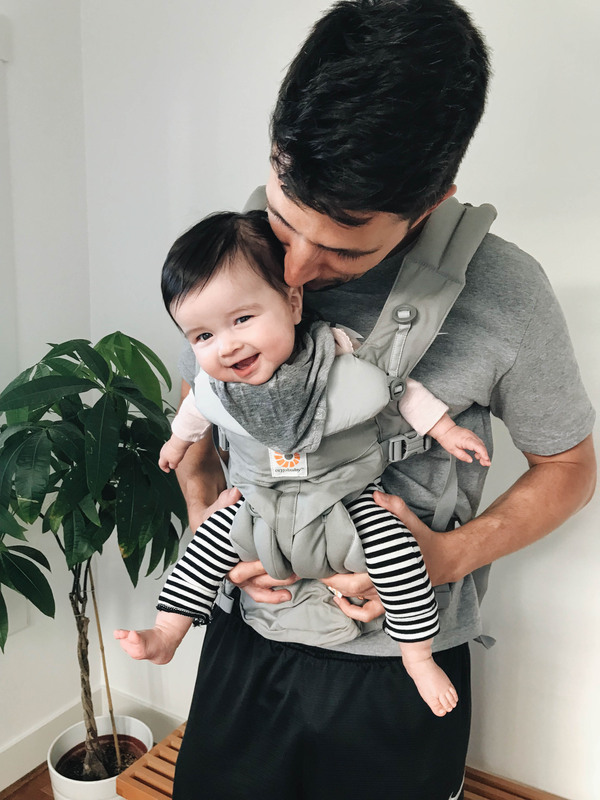 We recently bought the Ergobaby Omni 360, so Harper could face out and she loves it! When we get it out, Harper gets so excited. I highly recommend this carrier from the start. 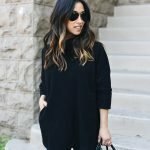 Ely’s & Co Sleep Sack – I was searching Amazon for neutral sleep sacks and found these. They’re 100% cotton and I love how affordable they are. They come in pack of 2 and we have a pack in 3-6 month and the 6-12 month. She’s almost outgrowing the 3-6 month. The neck size does run small… they work on Harper but keep in mind she’s on the petite size. Otherwise, I have no complaints with these. 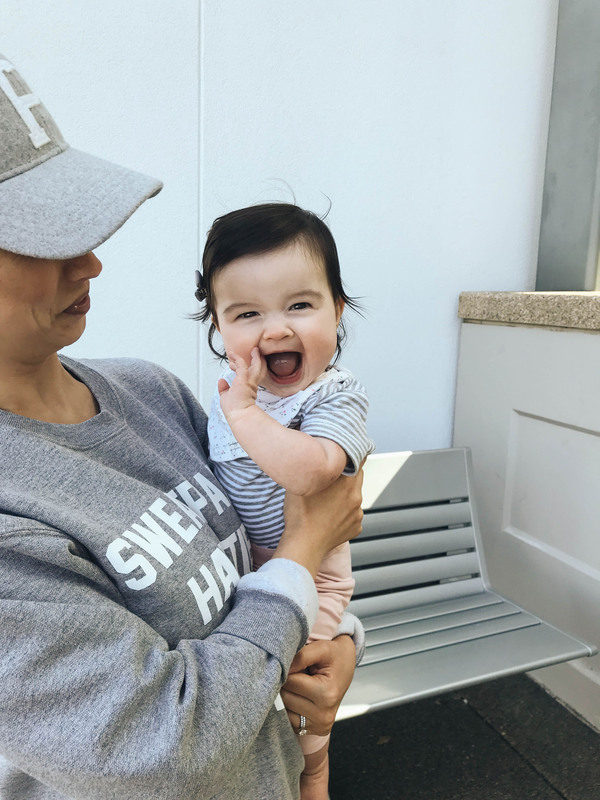 Stokke Steps High Chair – When I started thinking about baby gear when I was pregnant, I knew right away I wanted this high chair. It’s so chic and I love that it grows with your baby. She will be using this until she can sit in a normal chair. It’s pricey, but I have a feeling it will end up being a great investment. It was easy to put together, fits in with our decor, and so far it’s been easy to clean. 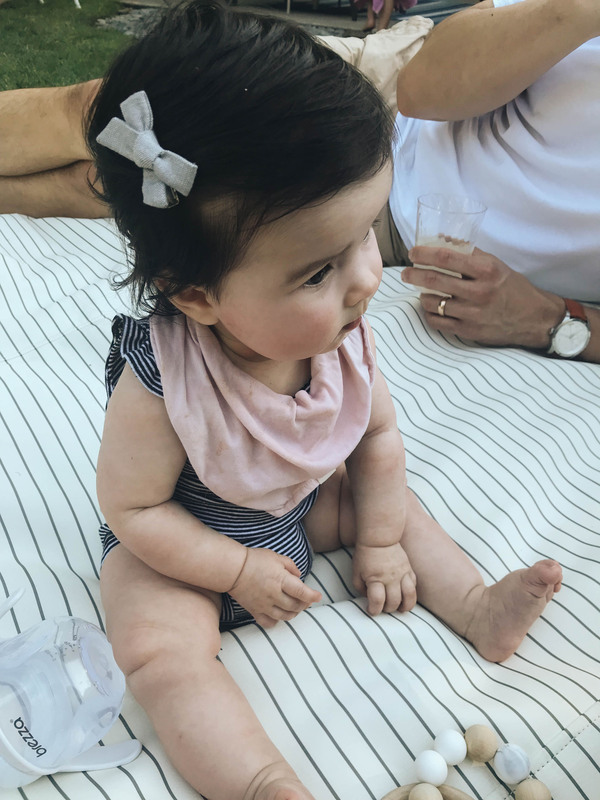 Bumkin Sleeved Bibs – I searched high and low for cute sleeved bibs for Baby Led Weaning. 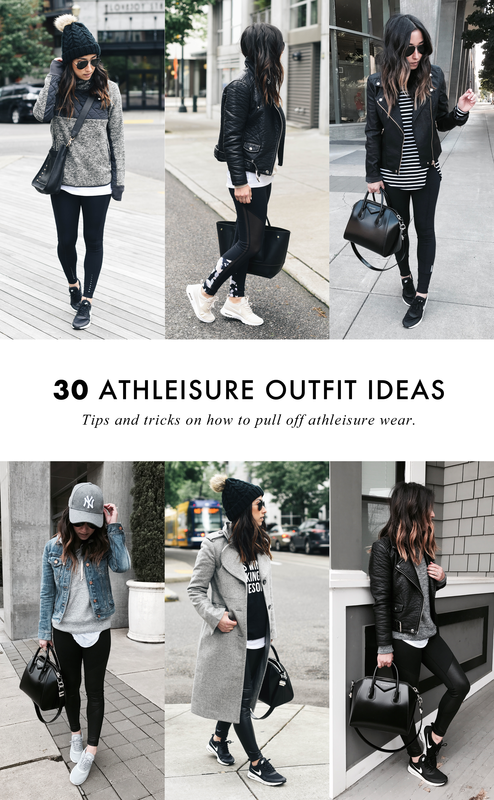 There’s a ton of options out there, but they’re all very graphic, bold, and over the top. I ordered several different options, but this one has been our favorite. It’s too bad they don’t have any other neutral, simple prints. Joovy walker – I had seen the Joovy Spoon while pregnant and knew I wanted this type of walker. It’s simple in design, not overly stimulating, and I love the large tray (for all her toys). The lowest level fits Harper right now, so she can easily walk around. She hasn’t mastered that quite yet, but she is able to be semi-mobile. This has been our favorite thing to set her down in if we’re parenting alone, or just need to get stuff done. It also gives her the perfect seat to watch the dogs without being in their line of fire. So far, we love it! *for those concerned about the safety of walkers – she is not near any stairs and we are always watching her. 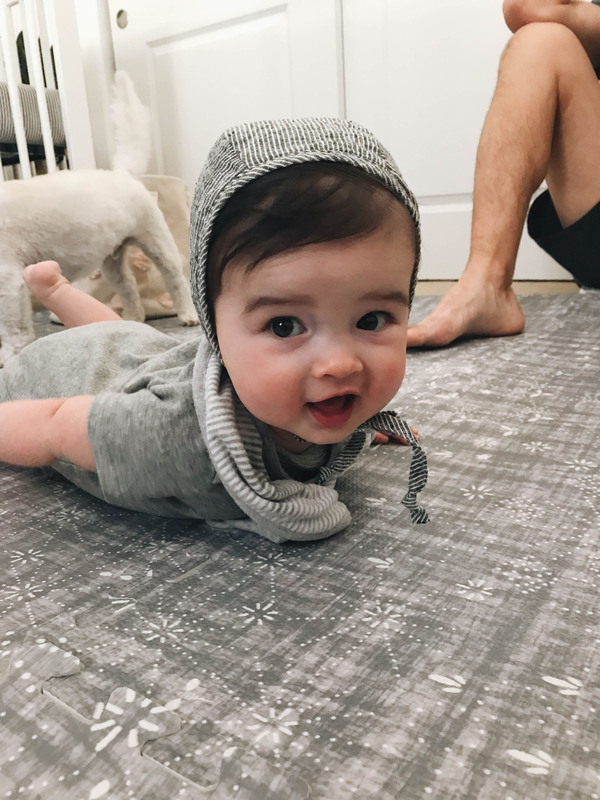 Little Nomad Roam Free Play Mat in Silver Lining – We are obsessed with this mat! The rug we had in Harper’s room at the old house wasn’t ideal. It shed and wasn’t soft. I discovered this non-toxic foam mat and knew it would be perfect for us. 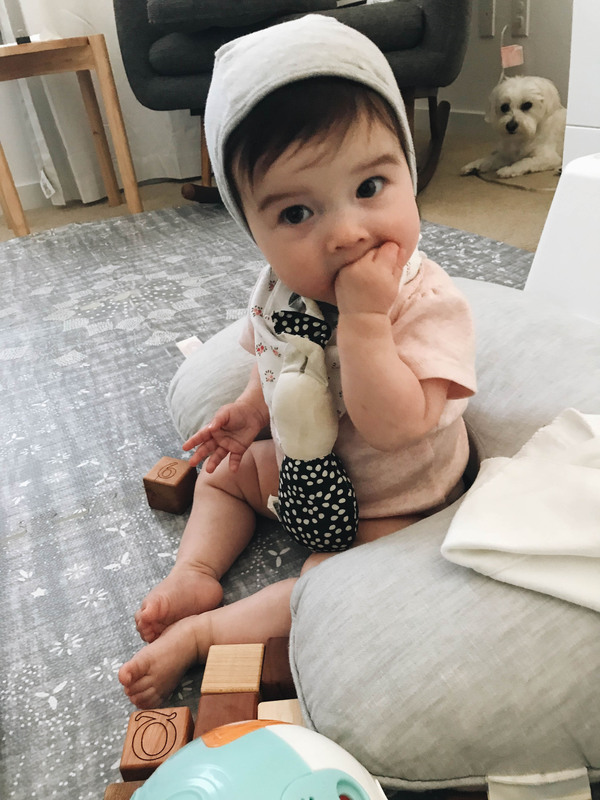 We all like sitting and laying on it and it’s perfect for tummy time and playtime. The only thing, it doesn’t lay as nice on carper as it does on hardwood floor. Just something to keep in mind. Otherwise, we LOVE it. Freshly Picked Mocs – I recently remembered I bought her a pair of these mocs and we’ve been wearing them ever since. They’re newborn size, but still fit her with room to spare. I’m wondering if they run big or if Harper has small feet. Anyone else have these? So far, I LOVE them. They stay on her feet and they make any outfit so cute. They’re a nice alternative to socks and give her support when she’s jumping in her jumper or walking in her walker.